It is with considerable fear and trepidation that I address my spidery scrawl to the proud possessor of the library hand4. The reasons that I have'nt done it before are many, chiefly because I am doing more work5 than I ever did in my life before and just the kind of work that everyone always said I'd never be able to do—work requiring care and judgment I don't do it perfectly by any means, but it seems to suit the publishers. I don't need to tell you how much care and anxiety and grief Roscoe's6 illness7 has caused me. 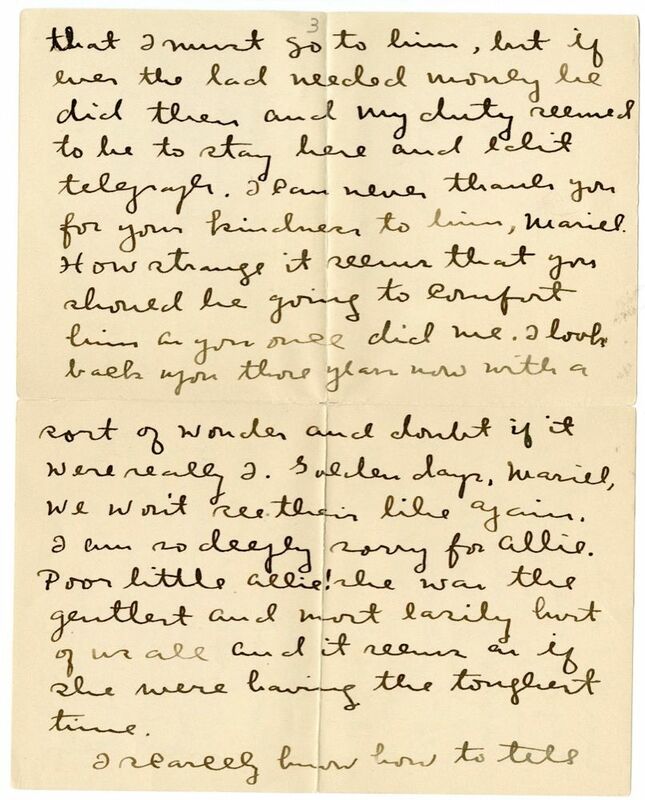 It seemed at times that I must go to him, but if ever the lad needed money he did then and my duty seemed to be to stay here and edit telegraph. I can never thank you for your kindness to him, Mariel. How strange it seems that you should be going to comfort him as you once did me8. I look back upon those years now with a sort of wonder and doubt if it were really I. Golden days, Mariel, we won't see their like again. I am so deeply sorry for Allie9. Poor little Allie! she was the gentlest and most easily hurt of us all and it seems as if she were having the toughest time. I scarcely know how to tell C you about my life here. It is a queer one, cut up between rather rigorous work and the craziest possible diversions. The theatre is about the only part of the old life that merges into this. Mr. Farrar10 broke his leg in a foot ball game several months ago, so I only see him in plaster, but now that he does'nt really suffer any more it is rather fun. Unfortunately I don't seem to be able to feel very deeply about him. His friendship is so warm and comforting and near to me that I don't want to change it for the other article in which the personal equation would be sure to make trouble. O I have grown enamoured of liberty! To be wholly free, to really be of some use somewhere, to do with one's money what one likes, to help those who have helped me, to pay the debts of one's loves and of one's hates! Mrs. Canfield11 and Dorothy12 came to see me at Christmas time and I had to introduce Mrs. C to a lot of club magnates. Fancy her coming to me for that. O it does my wickid un-Christian heart good to get even, to pay off the old scores and make people take back the bitter things they said in those years when bitter things Last pages of Jan 10, 189 (7) letter: hurt so. But you must not take this too seriously, I'm not really such a cross sour old thing. I suspect the trouble tonight is loss of sleep. First it was Melba13 in opera, next night a supper party given by Mrs. Collier14 to Mr15. and Mrs. Crane16, next night a dinner to Ethelbert Nevin17 the composer, and tonight I was out to dinner with a crowd at the Bishop's. I have met some very interesting people this year. Got to know Anthony Hope Hawkins18 quite well, he was here several days and one of my friends here knew him at Alforth. Marion Crawford19 is a terrible snob. Nansen20 is all the Norse gods and heroes in one, though he would talk nothing but Browning21 and Ibsen22. Ethelbert Nevin is prince and king of them all. He went shopping with me this afternoon and carried my bundles and got me a bunch of violets as big as a young moon. Think of it, the greatest of American composers and a fellow fo thirty with the face of a boy and the laugh of a girl. You know his "Thine eyes are stars of morning"23 and "O that we two were maying"24 "Narcissus"25 & "Little Boy Blue"26. 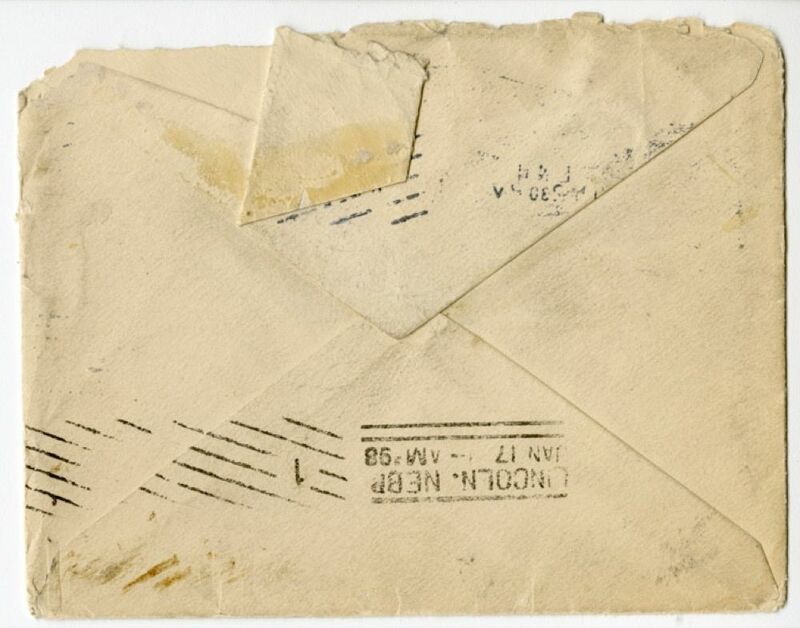 Document is two leaves, handwritten on recto and verso of each leaf. 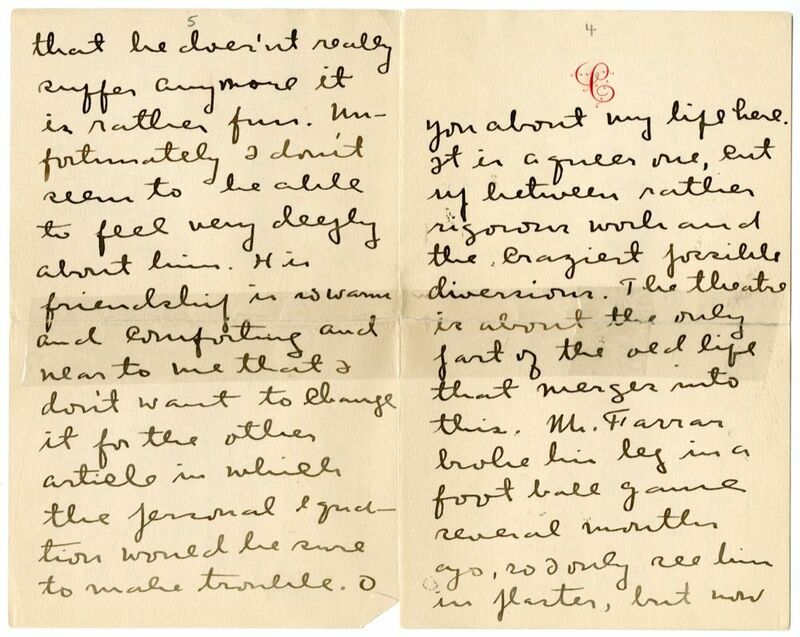 Includes two leaves of a transcription provided of missing pages. Includes one envelope, handwritten. 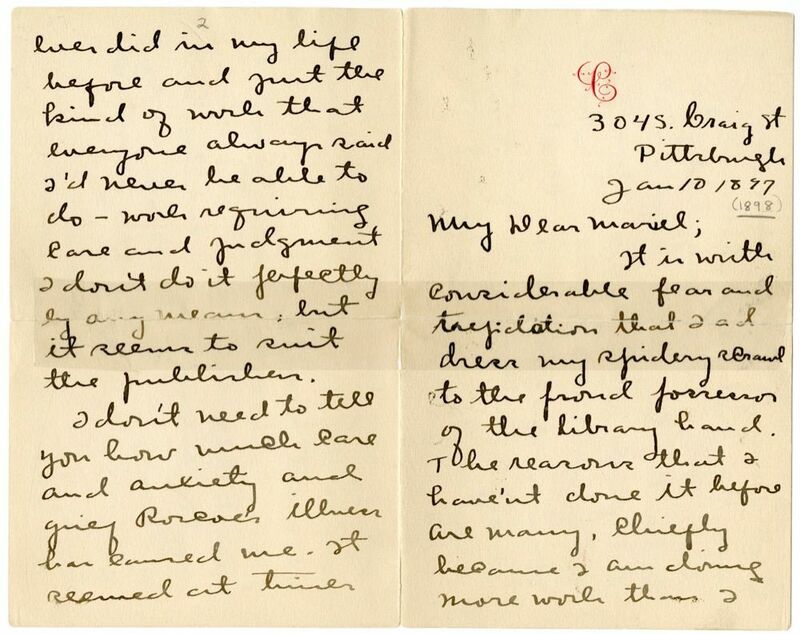 The library hand was a uniform style of handwriting developed about 1885 by Thomas Edison and librarian Melvil Dewey for the use of librarians writing catalog cards for books. It was widely taught in library schools. Cather worked as a journalist for the Pittsburgh Daily Leader, while writing a column entitled "Passing Show" for the Lincoln Courier and the Nebraska State Journal, as well as a monthly column for the Home Monthly under the pseudonym Helen Delay. Roscoe Cather matriculated at the University of Nebraska in Lincoln in Sepembert 1897. In early December he was struck by a serious illness. He was not able to be moved home to Red Cloud until January 1898; on February 11, 1898, the Webster County Argus reported that Roscoe Cather was able to go out again after his illness. Farrar, Preston Cooke (1870-1967). American educator; Cather’s friend. Born in Washington, PA, Preston Cooke Farrar graduated from Washington and Jefferson College in 1891 and taught English and Latin at Allegheny High School in Pittsburgh, PA, before receiving his masters in education from Columbia University in 1903. He married Edna V. Patterson in 1902; their daughter Elizabeth Dean was born in 1907. 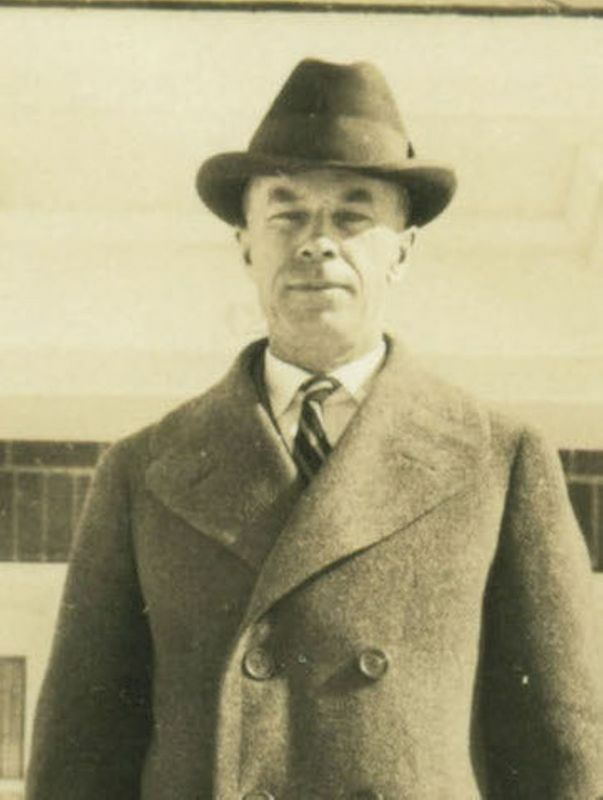 Farrar taught English at DeWitt Clinton High School and Erasmus Hall High in New York City before working as a professor of English at University of North Carolina in Chapel Hill. 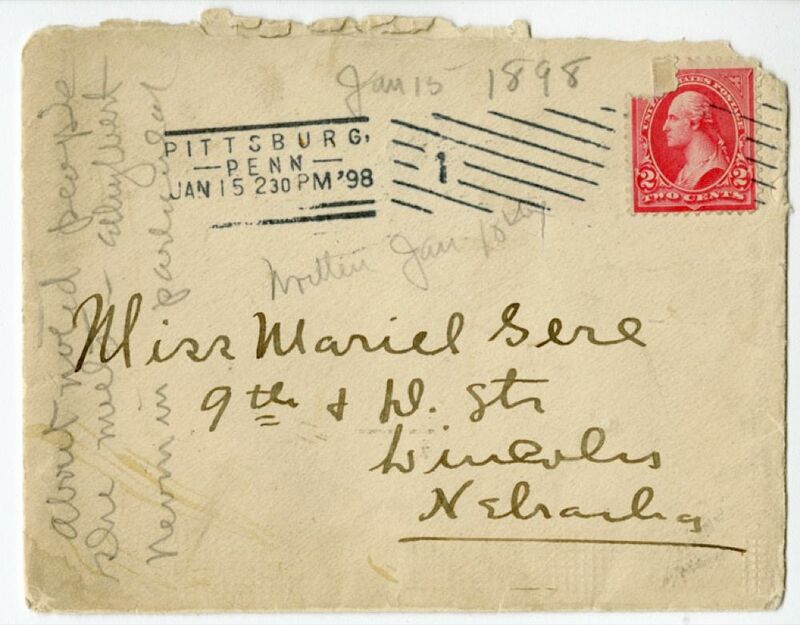 Cather met Farrar when she moved to Pittsburgh, and she suggested to Mariel Gere that he was romantically interested in her while she considered him a friend (#0047). Cather replaced Farrar as an English teacher at Allegheny High School (1904-06) and later visited with him and his wife in New York City. Melba, Nellie (1861-1931). Australian operatic soprano. Born Helen Porter Mitchell in Melbourne, Australia, she trained first as a pianist and organist. In 1886 she went to London, England, becoming a student of famed vocal teacher Mathilde Marchesi. She made her operatic debut in 1887, and from 1888 to her retirement in 1926 she was affiliated with London’s Covent Garden Opera house. 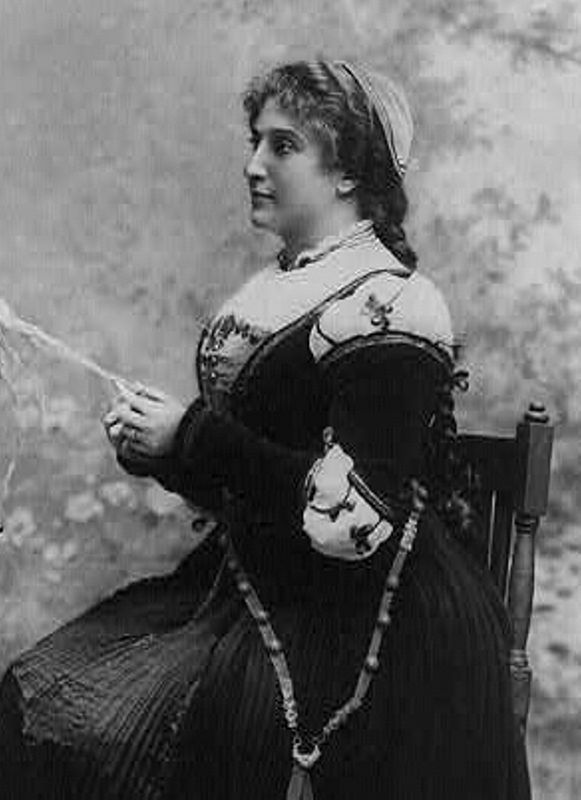 She quickly became an international star, making many world tours, and singing occasionally with the Metropolitan Opera in New York from 1893 until 1910. Foods such as Peach Melba and Melba toast were named for her. She was made a Dame of the British Empire in 1918. 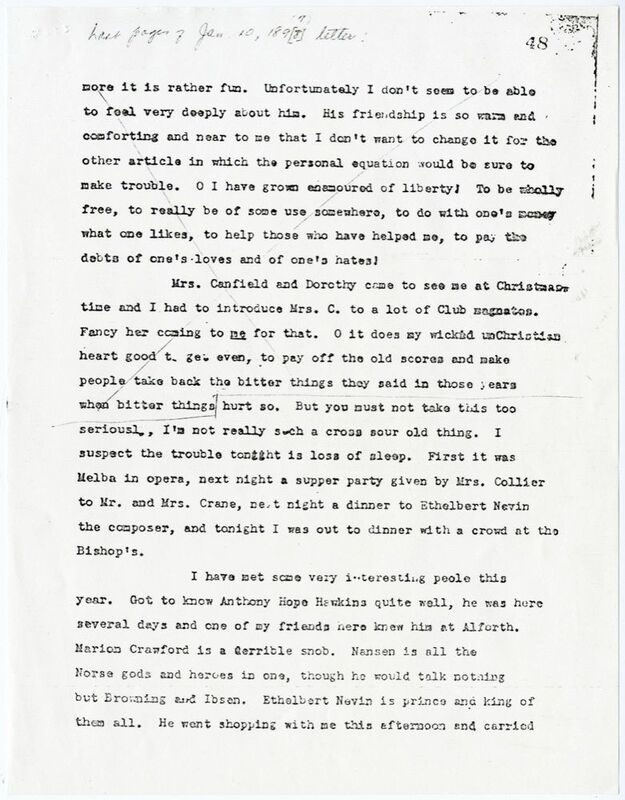 Cather mentions Melba in her early journalism and first heard her in Pittsburgh in 1898. Collier, Elizabeth Hudson (c. 1864-1924) (“Lizzie”). American actress. 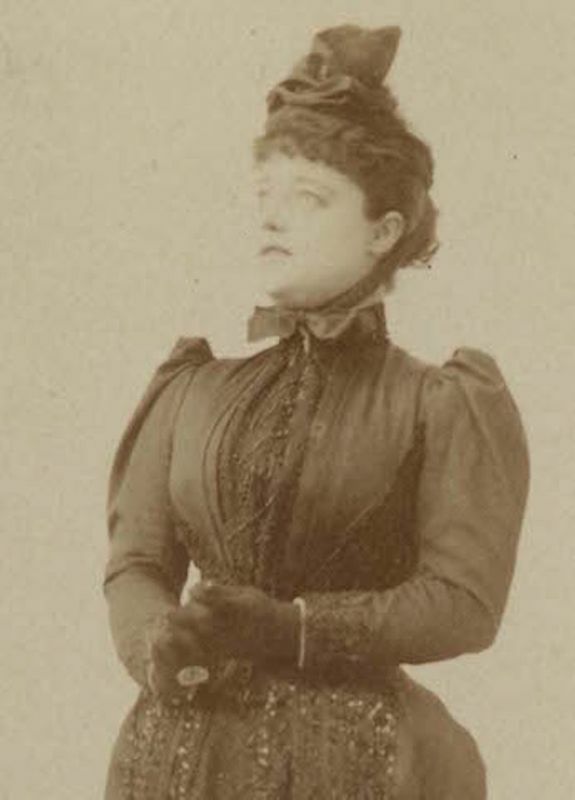 Born in New York, Lizzie Hudson played in touring companies in the 1880s, including those of the Collier, Joseph Jefferson, and William H. Crane companies. She married theatrical manager J. Walter Collier in 1890, about the same time as she began her New York City stage career. In the late 1890s she was the leading woman of the New Grand Opera Stock Company in Pittsburgh, PA; she did not return to the New York stage again until 1904, appearing last in Hedda Gabler in 1918. Cather saw Collier perform in Lincoln, NE, in the mid-1890s, and became friends with her in Pittsburgh, admiring her as a person and as an actress. Backstage with Collier one evening in 1899, Cather met Isabelle McClung, who would become her lifelong friend. Crane, William H. (1845-1928). American actor. Born in Massachusetts, Crane became one of the best known comic actors of his day. 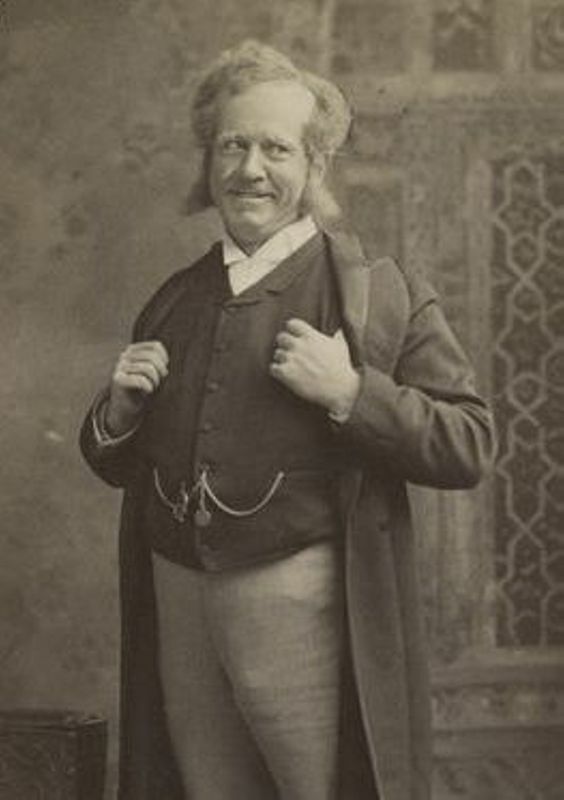 He partnered with Stuart Robson from 1877 to 1889, then took off on an independent career with his own company, starring in character roles. Popular as he was in the 1890s, his greatest success was in the title role in David Harum (1900), a role he recreated in the silent film (1915). He appeared in other silent films, notably as Buster Keaton’s father in Keaton’s first starring role, The Saphead (1920). Crane, Ella C. Myers (1850-after 1930). American actress. Born in New York, Ella Myers met aspiring actor William H. Crane in 1867 in Utica, NY; they were married three years later. She toured with him at least in the early years of their marriage, and he attributed much of his success to her advice and support. Nevin, Ethelbert Woodbridge (1862-1901). American pianist and composer. Born in Sewickley, PA, near the Edgeworth station in suburban Pittsburgh, Ethelbert Nevin was the fifth of eight children born to Robert Peebles Nevin, publisher of the Pittsburgh Leader, and Elizabeth Duncan Oliphant, an accomplished pianist. He received musical training at home from his mother and would later study piano and composition in Boston, MA, Germany, and Italy. In 1888 he married Anne Paul in Boston, where, for a time, he was established as a performer and teacher; their son, Paul, was born there the same year. Their daughter, Dorothy, was born in Berlin in 1892. 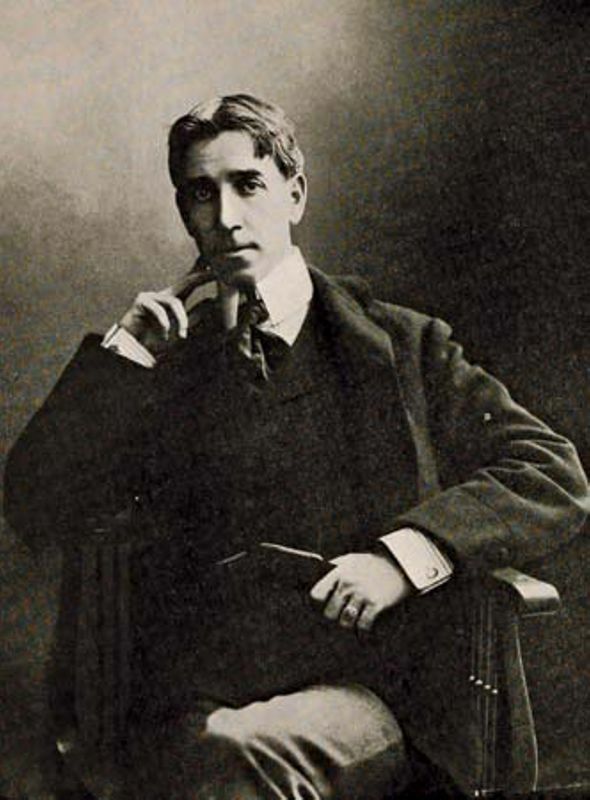 Nevin achieved success both as a performer and as a composer of pieces for solo piano, including “Narcissus” (1891), and songs accompanied by piano, especially “The Rosary” (1897), a setting for a Robert Cameron Rogers poem. In 1898, financial straits forced him to move his family to Vineacre, the family estate in Sewickley. 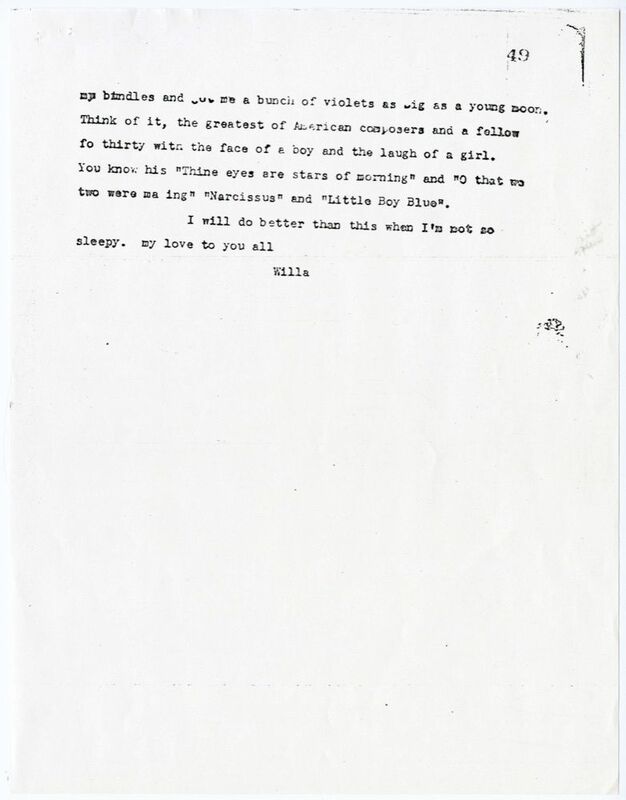 At the time, Willa Cather worked for his father’s newspaper and she already knew his music; she quickly became his friend, proclaiming herself “prouder of his friendship than I have ever been of anything” (#0055). She reviewed his homecoming concert in Pittsburgh and wrote “An Evening at Vineacre” (1899) for the Lincoln Courier and “The Man Who Wrote Narcissus” (1900) for the Ladies Home Journal. Nevin died in in New Haven, CT, where he and his wife had gone to spend the winter of 1900-1901. He inspired several poems in April Twilights (1903) and is the prototype for Adriance Hilgarde in “‘A Death in the Desert’” (1903) and Valentine Ramsay in “Uncle Valentine” (1925). Hawkins, Anthony Hope (1863-1933) (“Anthony Hope”). British writer. Born in England, son of a clergyman, Hawkins was educated at Oxford, then trained as a lawyer, being admitted to the Bar in 1887. 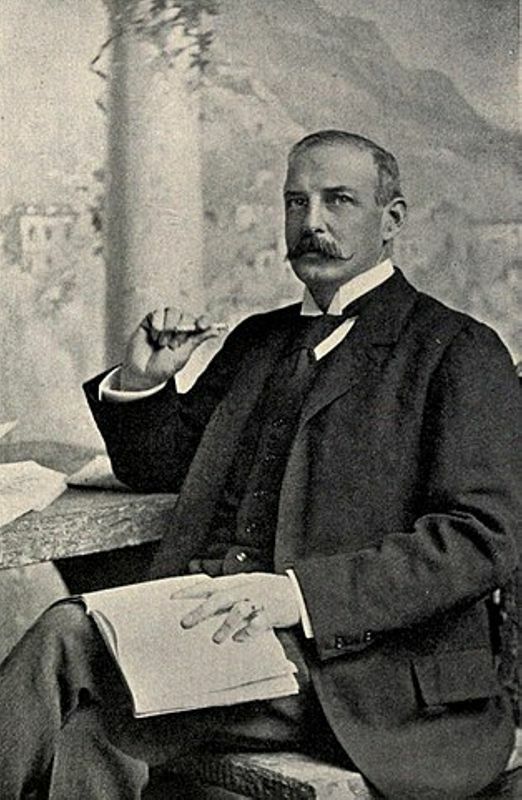 His practice allowed ample time for writing; he published short stories and six novels before his first success, The Dolly Dialogues (1894) and his greatest success, The Prisoner of Zenda (1894). The fictional country he created, Ruritania, inspired many “Ruritanian romances” by other writers. His 1918 knighthood honored his several World War I books. 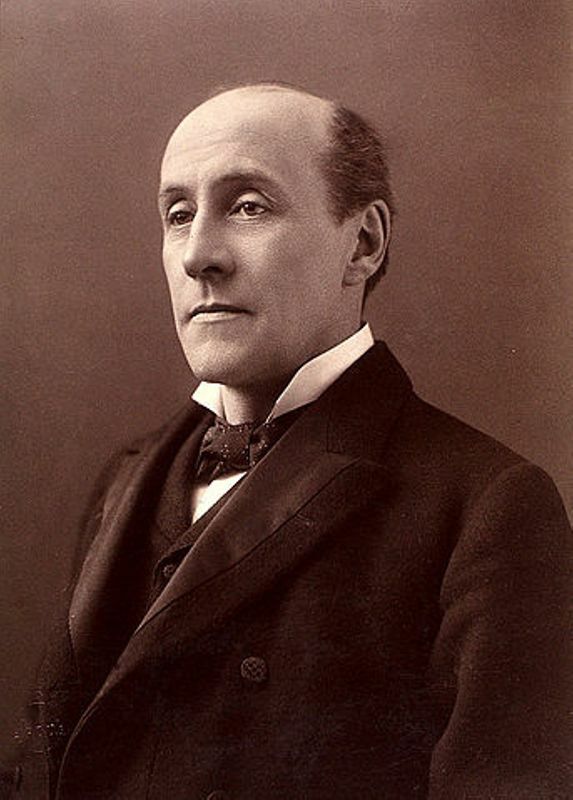 Cather praised “Anthony Hope’s” novels in her journalism of the 1890s, writing about The Heart of Princess Osra as it was being serialized in 1895. She met him several times when he visited Pittsburgh in late 1897 on a publicity tour. Crawford, Francis Marion (1854-1909). American-Italian novelist. Born in Italy, the son of the expatriate American sculptor Thomas Crawford, Francis Crawford studied at Cambridge, Heidelberg, the University of Rome, and Harvard. In 1883 he returned to Italy and made it his home for the rest of his life. More than half of his many novels (in the late 1880s and most of the 1890s he published two or three novels a year) are set in Italy. Crawford’s books were popular, and several were successfully dramatized on stage and film, but Cather felt he had sold out his talent for popular success. 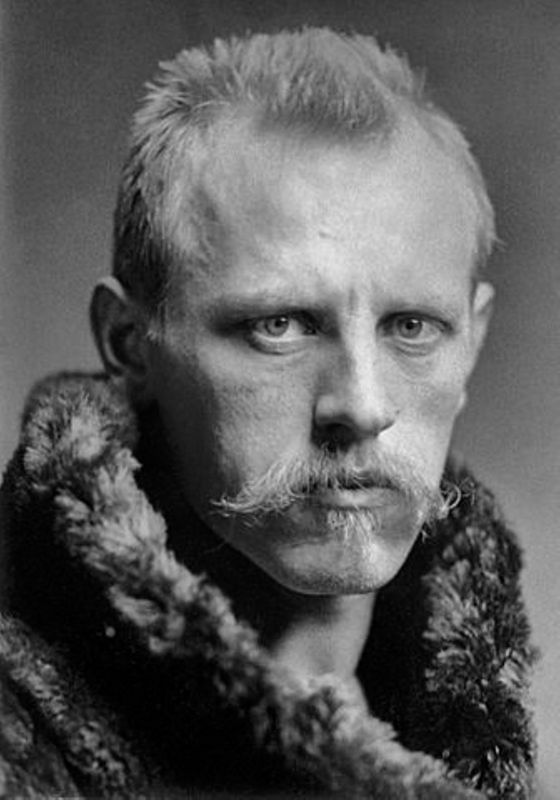 Nansen, Fridtjof (1861-1930). Norwegian Arctic explorer. While studying zoology at the University of Oslo, Nansen made his first trip to Greenland in 1881. After completing his doctorate in 1888, he led a two-month expedition across the interior of Greenland, which became the subject of two books, The First Crossing of Greenland (1890) and Eskimo Life (1891). In 1895-1896, he led an expedition that used an ice-breaking ship to attempt to reach the North Pole. As recounted in Farthest North (1897), he led a group that left the ship to attempt to reach the pole overland; they failed but came closer than any previous expedition. 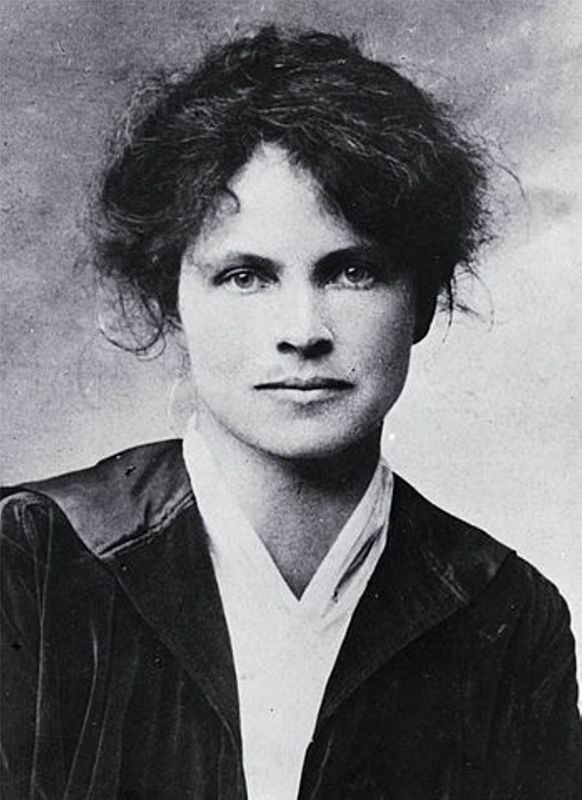 Cather met Nansen in 1897, when he came to Pittsburgh, PA, on his U.S. lecture tour. In later years Nansen was an advocate for Norwegian independence from Denmark and engaged in diplomatic and humanitarian work for which he was awarded the Nobel Peace Prize in 1922. Browning, Robert (1812-1889). British poet. 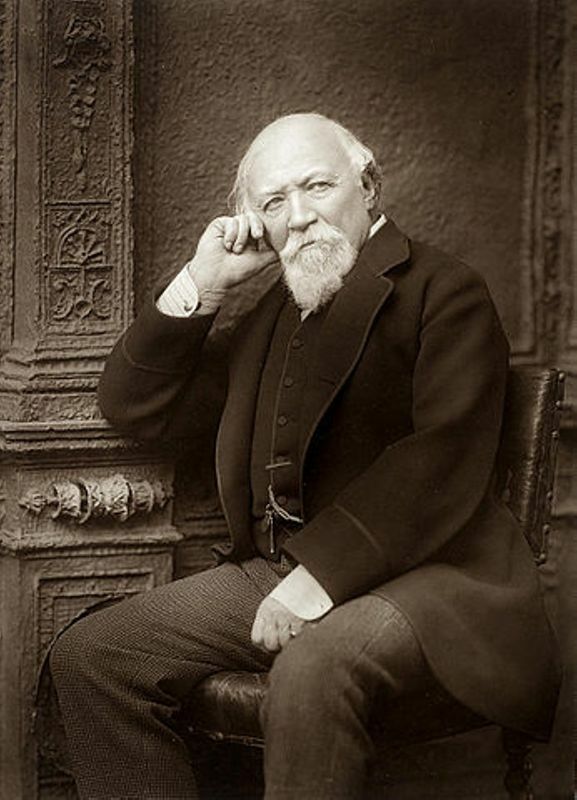 Born in London and educated at home, Browning’s early poetry won praise from critics, but his Sordello (1840) was condemned for its obscurantism. 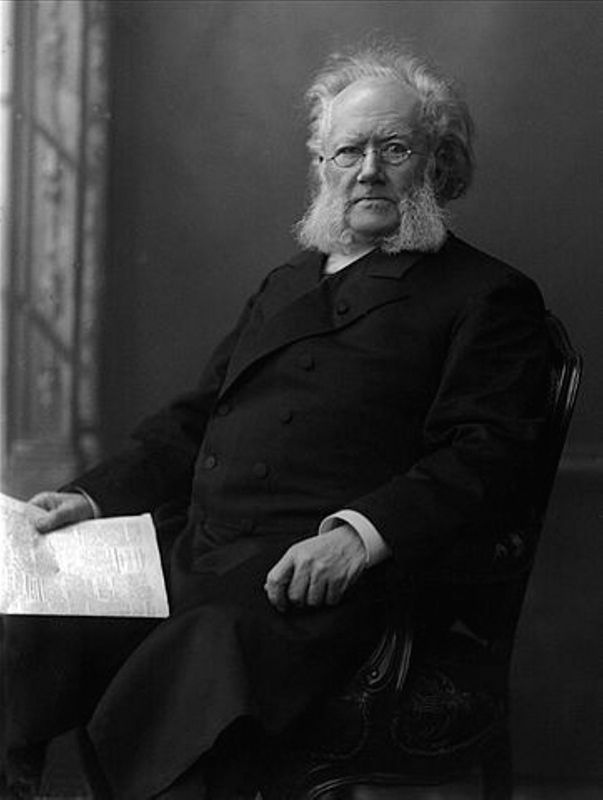 Widespread fame and popularity did not come to him until the publication of The Ring and the Book (1868-69), and earlier poems such as “My Last Duchess” gained new appreciation. 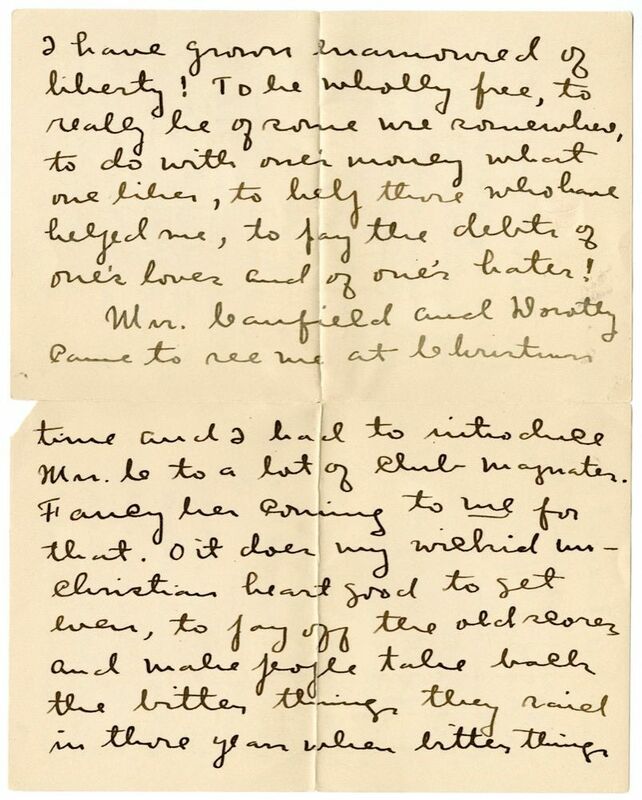 In 1845 Browning sought an introduction to Elizabeth Barrett, a better-known poet than he was at the time; she and Browning married in 1846 and went to Italy to live. Cather studied Browning’s work while at the University of Nebraska, and referred to it often in her early journalism, but she disliked the Browning Societies, which were formed to study his works. One of her early stories, “‘A Death in the Desert,’” borrowed the title of one of Browning’s poems.